TODAY'S GAME: The I-Cubs wrap up their 2018 season hosting a rain-shortened three-game set with the Round Rock Express. RHP Tyler Chatwood (0-0, 4.15) will be making his first start at Principal Park while on a major league rehab. The I-Cubs will see RHP Adrian Sampson (7-4, 3.73). WALK THIS WAY: Iowa arms walked a season-high nine batters Friday-- Kyle Ryan (5), Alberto Baldonado (1), Brian Duensing (1), Rob Zastryzny (1) and Craig Brooks (1). The I-Cubs were able to limit the damage on the free passes as only one walked batter made it home. It was Iowa's most walked issued in a game since June 10, 2017 in a seven-inning doubleheader game against Colorado Springs. Juan Paniagua (4), Miguel Mejia (2), Andury Acevedo (2) and Manny Parra (1) combined for nine walks in an 8-1 I-Cub loss. D-FENCE: Iowa rolled up four double plays Friday for a new single-game high of 2018. Stephen Bruno was apart of all four as the second baseman. The last time Iowa turned four double plays in a game was more than one year ago on July 6, 2017 at Oklahoma City. 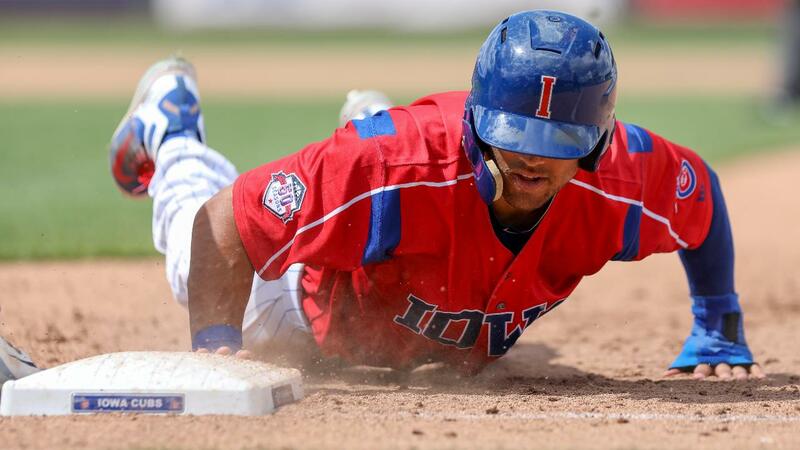 ROSTER ROTATION: The Chicago Cubs made a flurry of roster moves impacting the Iowa Cubs. Pitchers Luke Farrell and Rob Zastryzny were designated for assignment as catcher Taylor Davis and outfielder Terrance Gore were selected by Chicago and moved to the active big league roster with September expansions. Filling the spots, Iowa added lefty Jaime Garcia, a recent Cubs sign, and catcher Eric Gonzalez from Single-A South Bend. Iowa also added starter Alec Mills back to the roster after he was optioned by Chicago. POWER PLAY: Over his last 11 games, Jacob Hannemann has collected nine extra-base hits, including his 14th double of the season in last night's game. During the span, the outfielder has gone 13-for-39 with six runs and six RBI for a .333 average. He has yet to register a walk since Aug. 14 (18G), striking out 14 times in the process. FREE BASEBALL: After going 10 innings in Friday's 6-5 loss, Iowa is now 6-8 (.429) for 13th place in the PCL. The I-Cubs' 14 extra-inning contests are good for third in the league, behind New Orleans (19), Oklahoma City (19) and Nashville (15). AGAINST ROUND ROCK: Iowa and Round Rock meet for the second match of a three-game set. Round Rock edges Iowa 7-6 in the season record after taking last night's extra inning game, 6-5. The I-Cubs avoided a losing record while visiting the Express for two series in May, taking a 3-1 slate and splitting the second, 2-2. The road trips book ended a 1-3 series with the Express at Principal Park. Iowa's only winning road series record of 2018 comes at Dell Diamond where the team is 5-3. Jacob Hannemann, Chesny Young and Ryan Court headline the Iowa offense with a .394, .364 and .341 average, respectively, against the Express. FINDING A GROOVE: After hitting his fourth home run on the season to tie the game in the ninth inning Friday, Chris Coghlan capped off his August going 26-for-96 (.271) with 18 runs, nine doubles, three home runs and 11 RBI over 29 games. Coghlan has made a significant turnaround from July to August. Over 22 games in July, Coghlan went 15 -for-79 for a .190 average. The utility man scored nine runs, two doubles, a triple, home run and collected four RBI over 22 games. Coghlan walked just six time while striking out 19 times in July--compared to 15 walks and 14 strikeouts in August. Over his last 10 games, he is hitting to a tune of .344 (11-for-32) scoring seven of his 18 runs and amassing five of his 11 RBI in August. FREE AND EASY: Since coming off the DL on Aug. 17, Mike Freeman has registered a hit in 10 of 15 games. During the span, he has collected eight multi-hit efforts. Despite going 0-for-3 at the plate last night, the shortstop collected his ninth and 10th walks since being reinstated, has reached base in 13 of 15 games and is hitting .340 (18-for-53) with 10 RBI. He is second on the team with 51 runs overall, narrowly trailing Mark Zagunis' 63 despite missing almost two months. TAKING A STROLL: With another walk in Friday's game, Mark Zagunis ranks third in the PCL in walks, drawing 70 free passes over 115 games. Zagunis also sits in the top 10 in OBP with a .395 percentage. In the month of August, Zagunis has reached base in 19 of his 23 games played. SHORT HOPS: Chris Coghlan and Mark Zagunis each collected a duo of hits and RBI, accounting for four of Iowa's five runs on the night Friday....Iowa has lost six openings due to weather postponements, its most since 2008.